Moving to Boulder last year, I learned its just as big if not bigger here. I live right near the University, so I had planned to stop and see what it's all about over here. Unfortunately, they're locking it down this year, ticketing any non-students or faculty who pass through there. Again, it's harmless, but I suppose since it all technically happens on school grounds, it would be frowned upon if there wasn't some police presence. 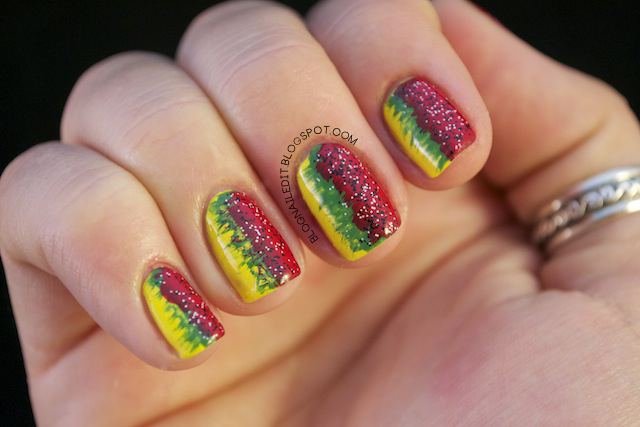 So in honor of the most harmless and relaxed day of the year, I've done a little rasta-tribute using this tutorial and two new Etsy glitters from windestine. On top of the three China Glaze's used here (Happy Go Lucky, Hey Sailor, and Starboard) are windestine's black and white glitters, Asbestos and Carbon Copy. I'm so unbelievably happy that I found and bought these two colors because they can completely change a manicure. The red was taking over most of my nail (oops), and I didn't like that. So enter windestine glitters and my problem's solved. Looks great! Love the tie-dye effect. so creative...love it! i want the snow globe polish! Looks like she still has the mini size of Asbestos. Here's a link, but you better hurry! There's only 5 left, and once word gets out, I bet they'll go fast! 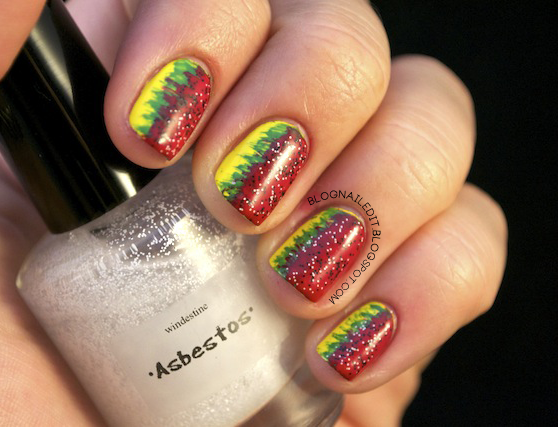 Happy 4/20 :) Love your mani! I have been admiring your work on this blog. As soon as I saw I was to select other blogs for this award I knew your blog was a very deserving and an was choice. Thanks Kelly! I've added it to my Awards and Mentions page. I'm so glad you like what I do over here on my blog!